As the Queen’s turns 90 today I recall the first time I met her bodyguard. “As we walked along Petty France, James gave me a potted history of the men I was about to meet. The Grenadier Guards is the most senior of the five regiments of Foot Guards and one of the oldest regiments in the British Army. Formed in Bruges in 1656 as the Royal Regiment of Guards to protect the exiled King Charles II, it has gone on to serve ten kings and four queens, including the current Queen Elizabeth II. The Regiment was renamed the “First Grenadier Regiment of Foot Guards” in 1815, in recognition of its part in the defeat of the French Grenadiers of the Imperial Guard at the Battle of Waterloo, and has been so named ever since. For the last decade or more my lunch had been a sandwich and a bag of cheese and onion, hastily eaten at my desk while simultaneously trying to stay on top of my email inbox. As James explained, this is not how the officers of the Queen’s bodyguard choose to conduct themselves. As befits one of the most esteemed regiments in the British Army, officers assemble in the anteroom from 12.30pm and then at 1pm sharp process through to the dining room where they are served a three course lunch by the Officers’ Mess Colour Sergeant and his staff. Once lunch is complete they take coffee in the anteroom before resuming their work schedule at 2pm on the dot. I suspect it’s a routine that has changed little since those early days in Bruges when Henry Wilmot, First Earl of Rochester commanded the battalion, except perhaps in one regard. Henry Wilmot was a popular commander who liked a drink and according to contemporary commentators ‘drank hard, and had a great power over all who did so, which was a great people’. The modern Grenadiers may not have succumbed to the vulgarity of a sandwich lunch, but in a concession to progress, there was no hard drink to be had. James and I presented our MoD 90’s – our British Army photo identity cards – at the barracks guardroom and were duly escorted through a maze of subterranean passageways to the mess. Despite its historic location in the heart of London, it’s an ugly concrete building of little, if any, architectural merit that conceals a rich history. Within the drab exterior the Grenadiers have decorated the walls with paintings and portraits chronicling their glorious past. Severe looking senior officers dressed in black frock coats lined the walls, alongside enormous oil paintings recording magnificent, hard-won victories from a bygone age. One such painting struck my eye. A little smaller than the rest it seemed oddly out of place, although like so many others it depicted a fierce and violent battle. A small group of about eight or ten Grenadiers can be seen taking cover behind a low wall. As those in the background fix bayonets, perhaps preparing to fend off an imminent assault, those in the foreground are engaged in a furious firefight. Men can be seen standing dangerously exposed above the parapet firing their belt-fed machine guns at an unseen enemy, while their comrades work furiously to keep them resupplied with ammunition. The air is thick with cordite and dust, their situation looks pretty desperate. I can feel the heat of the battle, hear the crack and thump of rounds passing perilously close, smell the sweat and blood of these men as they stand firm on their position, fighting for their lives. 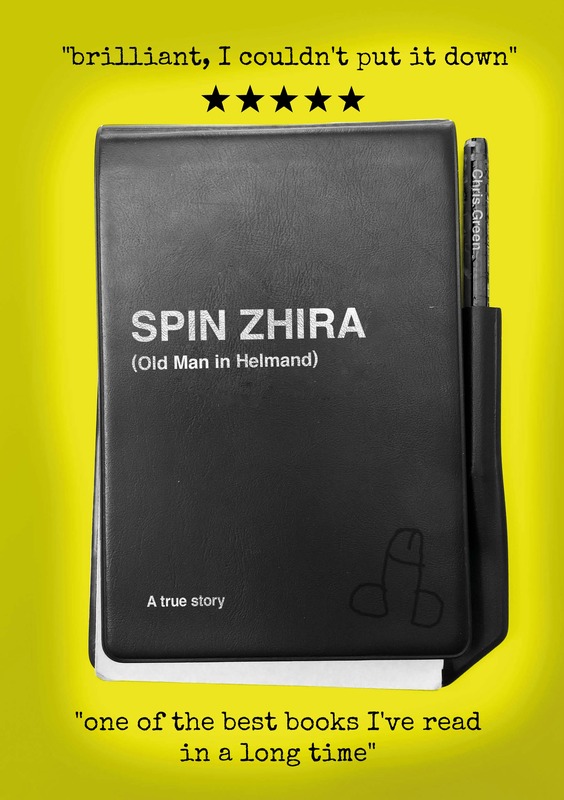 SPIN ZHIRA: Old Man in Helmand is the true story of one man’s midlife crisis on the front line of the most dangerous district in Afghanistan where the locals haven’t forgiven the British for the occupation of 1842 or for the Russian Invasion of 1979. All infidels look the same so you can’t really tell them apart. Now available on Amazon Kindle for the special pre-order price of £1.99.